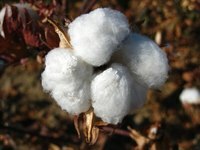 Cotton fiber has been used for hundreds of years in clothing, linens and other textiles. It is soft, versatile, and the raw fibers can be spun into strong threads and yarns that can rival animal fibers in warmth and durability. Although you can purchase cotton yarn in stores, many people wish to try their hand at spinning cotton yarn themselves. To spin your own cotton yarn, you will need a few basic materials that can be found at any textile or fabric store. Collect two to three balls of raw cotton, and place them in between two fiber combs. The combs should be facing in opposite directions. Pull the combs through the cotton using long strokes. This is referred to as carding the fibers and will effectively separate the fibers of the cotton and help remove the cotton seeds. Continue carding the cotton until you are left with long, even fibers. Repeat this process until you have around two handfuls of carded cotton. Spin the carded cotton fibers. If you have a spinning wheel, place the end of the fiber onto the spindle, then spin the wheel while feeding more cotton fibers into the spindle. If you are using a hand-held spindle, twist the end of the carded cotton fibers into the tip of the spindle, then spin and drop the spindle down repeatedly. Bring the spindle up into your hand to wind the yarn around the spindle, feed more cotton fiber into the spindle, then twist and drop it down again. Once all of the cotton has been spun, you will be ready to wind it into a skein. Hold your spindle in one hand, and hold the end of the spun yarn in the other. Wind the yarn around your elbow, then back around your hand again. Repeat this process until all of the yarn has been wound around your hand and elbow. Remove the yarn from your arm. Hold the ring of yarn open, and twist it. Fold the twisted skein in half, and hook the end of one side into the end of the opposite side. Your skein of hand-spun cotton yarn is now ready to be used for weaving or knitting.